This PDF 1.4 document has been generated by Writer / Office Suite X 3.3, and has been sent on pdf-archive.com on 23/01/2013 at 15:02, from IP address 76.29.x.x. The current document download page has been viewed 4294 times. File size: 186 KB (23 pages). Skystrike: Ka’Bandha may assault after Deep Striking. Skystrike: Kyriss may assault after Deep Striking. Bloodfeeder special rule, then both suffer the wound. roll the random power but suffers an unsaveable wound each time it does so. 1 Terrify – All enemy units with a model within 12” immediately take a Pinning test. 2 Re-Knit Host – Regain all lost wounds. benefit from any ability that affects deploying via Deep Strike (such as a Locator Beacon). (including the Daemonhost) take an immediate Str 4 AP 3 hit. 5 Timeshift – The Daemonhost may move and assault 12” this turn and has 2D6 attacks rather than D6. 6 Warp Strength – Add +D3 to the Daemonhost’s Strength and Toughness for the turn. they use the flamer template this is replaced with the Hellstorm template. Redeployment and Recon Strategic Assets, see Apocalypse Rulebook for details. Iron Hide: Exactly as it appears in the Chaos Daemons Codex. 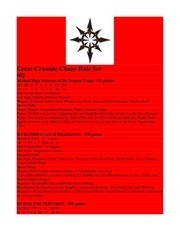 * Breath of Chaos: As it appears in the Chaos Daemon Codex but using the Hellstorm Template. that are changed become Changelings. * Daemonic Gaze: As it appears in the Chaos Daemons Codex only at a 72” Range. * Warpfire: As it appears in the Chaos Daemons Codex only at a 72” Range. * Pavane of Slaanesh: As it appears in the Chaos Daemons Codex only at a 72” Range. * Transfixing Gaze: Exactly as it appears in the Chaos Daemons Codex. * Soul Devourer: Exactly as it appears in the Chaos Daemons Codex. * 3+ Daemonic Invulnerable Save against all Psychic Powers with a Strength value. * Counts as having a Psychic Hood. 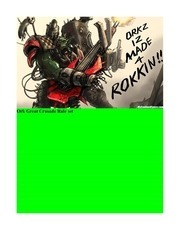 For details, see Codex: Space Marines, p.56. * Amon Chakai may force any psychic opponent to re-roll any successful Psychic Hood test. · All Khornate Daemons within 24” get +2 to their combat resolutions for any Assault. 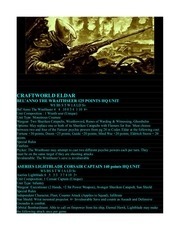 Death Strike Whip: As it appears in the Chaos Daemons Codex but with Assault 4. The Blades of Incandescent Fury: This is an immense daemonically possessed double-headed axe. not use grenades or Melta-bombs. Shalnaneth may choose to use his whip instead of running. Blessing of the Blood God: Exactly as it appears in the Chaos Daemon Codex. Victory Bellow: Counts as an instrument of Chaos. characters, vehicles and buildings of all kinds. · All Slaaneshi Daemons in play get +1 to their combat resolutions for any Assault. Aura of Acquiescence: Exactly as it appears in the Chaos Daemons Codex. Lethal Caress: All N’Kari’s attacks in close combat cause Instant Death and count as Rending. Delight in Combat: All models except Eternal Warriors within 6” become Fearless. Preferred Enemy: N’Kari counts everything and anything with a WS as a Preferred Enemy. described in the 40K Rulebook only with 3D6 instead of 1D6. that are changed become Fiends of Slaanesh (can be upgraded). Scream of Scouring Ecstasy: Counts as the Breath of Chaos Gift but using the Hellstorm Template. 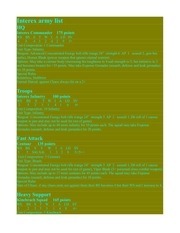 · All Nurglish Daemons in play get +1 to their combat resolutions for any Assault. the start of every round of close combat. Does not affect daemons or models bearing Nurgle’s Mark. Cloud of Flies: Exactly as it appears in the Chaos Daemon Codex. Anti Plant Barrage Support Asset: Exactly as it appears in the Apocalypse rulebook. Feel No Pain: Puzuzu has the Feel No Pain Universal Special Rule. roll to Wound as normal without any special bonuses. that are changed become Beasts of Nurgle (can be upgraded). Tide of Corruption: Counts as the Breath of Chaos Gift but using the Hellstorm Template. Puzuzu being the effected daemon. cannot be made any better or worse by any factor, although impassable terrain remains impassable. grenades for +5 points and/or melta bombs for +12 points. points per model, unholy might for +10 points per model, and/or death strike for +15 points per model. points per model, and/or we are legion for +20 points per model. breath of chaos for +15 points per model. 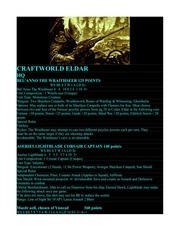 Wargear: Merhyll; Carapace Armor, Bolt pistol, Close Combat Weapon, Frag and Krak Grenades. Options: May include up to seven additional warhounds at +13 points per model. Warhound is slain, Merhyll loses these abilities. Unit Type: Infantry – Data-Daemons count as two models for transport purposes. thunder hammer at +15 points each. targeted vehicle. 6: A single penetrating hit is caused on the target and re roll on the Scrapcode chart. 2d6 Str 4 AP 3 hits. Once casualties are resolved, add up the total number of unsaved wounds caused. wounds caused. Gida’Ljal may act as normal in the assault phase. melta bombs for +12 points. squad may take assault grenades for +5 points and/or melta bombs for +12 points. Options: may take either a chariot of Khorne for +10 points or a Juggernaut of Khorne for +15 points. may take bolt of Tzeentch for +15 points per model. Demolition Charge for +15 points. for a Power Weapon for +15 points, a power fist for +25 points, or a thunder hammer for +35 points. may be given either a las pistol or Autopistol (range 9” Strength 3 AP 6 pistol) for +4 points each. icon for free. One Bloodletter of Khorne may be given instrument of Chaos for +10 points. Options: May Include 10 additional hounds for 9 points each. Karanak Hound of Vengeance for +24 points. for +5 points. One seeker of Slaanesh may be given an instrument of chaos for +10 points. 2 Re-Knit Host – ‘The Red Angel’ immediately regains d6 wounds (cannot exceed starting wounds). deploying via Deep Strike (such as a Locator Beacon). 5 Timeshift – ‘The Red Angel’ may assault 12” this turn and has 2D6 attacks rather than D6. 6 Warp Strength – Add +D3 to ‘the Strength and Toughness of The Red Angel. unit, roll 2d6 and consult the chart. quickly perish and are destroyed. May not be re-rolled! quickly perish and are destroyed. May not be re rolled! Options: May Include 2 more Giant Freaks for 80 points each. Possessed: A Contagion Plague-engine ignores Gun Crew Shaken and Driver Stunned results. immune to the effects of an Explosion of Filth. Daemonic Possession: The Cauldron of Blood ignores Gun Crew Shaken and Driver Stunned results. may reroll failed difficult terrain tests. Daemonic Possession: The Cannon of Khorne ignores Gun Crew Shaken and Driver Stunned results. This file has been shared by a user of PDF Archive. Document ID: 00070959.